I've never been into reality TV, non-fiction books or documentaries. I always joke that I have enough reality in my life and my reading or movie watching is for "escape". When someone suggests a true book about autism for me to read, I cringe. I don't want to spend my precious "fun" time reading about that which I am already living. I've been a stay at home mom for almost 19 years. I've worked part time here and there and volunteered a lot when the kids were younger but for the most part, I have been unemployed since Joe was born. I always thought I would go back to work as soon as our youngest was in school full time, but when Alan had been kicked out of Sunday School, gymnastics and Kindermusik by the time he was 6 I just stayed home. For the most part, I haven't regretted it and neither has DH. We often joke that he is in charge of the income and I am in charge of the outgo and they are both equally important. As long as I keep our spending in line, we are able to put aside a little something and still have me stay home. The last few years I have even had the time, interest and resources to get back into miniatures which has been a blissful escape for me. When I am having a tough day, I put Alan on the bus and head down to the basement to play with my minis. When the afternoon or evening is tough, I know I can escape as soon as both boyz are out of the house the next day. I work on them rarely on weekends -- mainly because I prefer to spend my evenings and weekends with DH which is its own escape. But ever since Joe graduated in May, I am having to relearn how to be a SAHM. 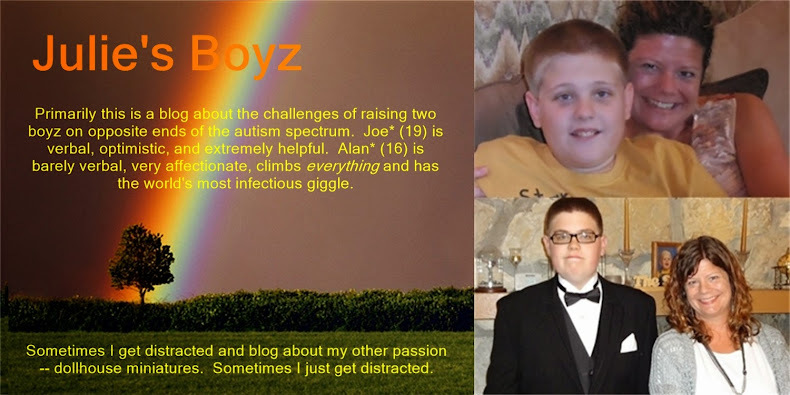 For the last 12 years both the boyz have been in school almost full time. This has given me more than enough time to keep the house marginally clean, run errands, work out, read, have an occasional lunch with a friend, do my Facebook and blogging and most important -- work on my minis. Starting this summer I began to bring projects upstairs and work on them at the kitchen table while keeping an eye on Alan in the yard. This has helped some, but some of my projects (despite being "miniature") are not very portable. In addition, all my supplies are in the workroom in the basement. Joe decided a few months ago that he was going to get back into working on models. (I almost said "modeling" and I had this sudden flash of Mr. Camera Shy hamming it up for a photographer!) We've been happy that he was doing something other than watching movies. Because really, how many times can you watch the entire Harry Potter movie series in chronological order? He has finished two cars and while they aren't what anyone with a distinguishing eye would say are well done, they are helping him follow written directions, improve his hand to eye skills and work on project completion -- which are all important things. So what is the downside? This has put Joe in close proximity to me for large chunks of my day that used to be my escape. Now add to that my foot surgeries and you have a Mom that really wants to see her 19 yo gainfully employed!! I think Joe's models are amazingly well done! Great job Joe! Hope your foot is healing well and Joe can get a good full time job soon so you can have some you time. I recently wrote a blog post about a garden done in miniatures we visited. I thought of you when I wrote it. It was called The Garden. Wow! I must have missed that when I wasn't reading blogs. I will go look for it. You ALWAYS comment on my posts even when they are lame! :-) I appreciate it! Hi Julie! I just wanted to know if you could answer my question about your blog! My name is Heather and if you could email me at Lifesabanquet1(at)gmail(dot)com that would be great!